Idli is one of the healthiest southern Indian breakfasts. Plain Idli is great but with vegetables it is awesome. It can be served as a breakfast, evening snack or as a meal with sambhar and chutney. Idli is soft and easy to eat so kids love it too. Prepare Idli batter as usual or buy it from any Indian grocery store. In a pan, heat cooking oil and add mustard seeds. When it starts splattering, add green chilies, curry leaves and vegetables. Sauté for 3-4 minutes. 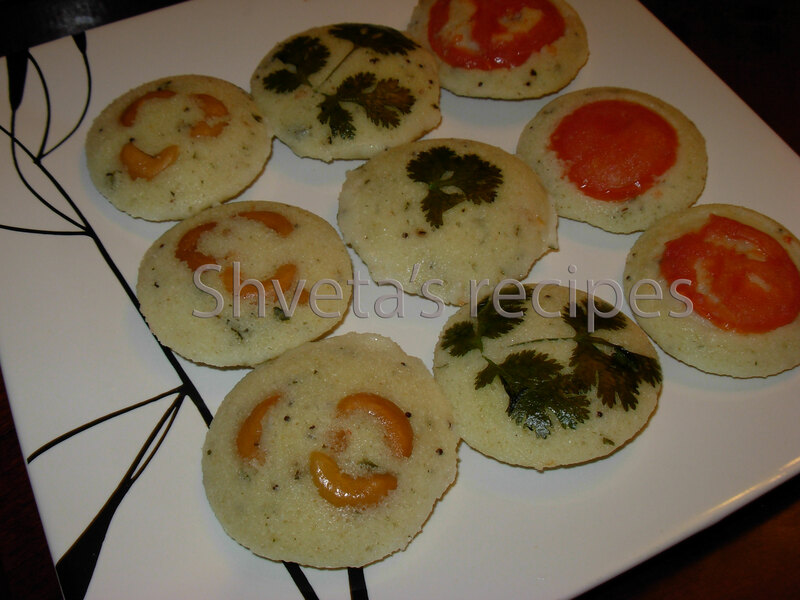 Do not cook the vegetables completely as they will be cooked later with the idli batter. Add salt to the vegetables and cool it for few minutes. Add the vegetables to the Idli batter and mix well. For making Idlies, grease the Idli molds and arrange tomato slices in some of the molds, or cilantro leaves or cashews. Now pour the idli batter in each mold and steam it. Once the Idlies are cooked, keep the molds aside for few minutes to cool down and then gently take the idlies off the mold and flip them. Arrange the vegetable side up in the serving plate. Enjoy warm Idlis with green cilantro chutney or coconut chutney and sambhar.